The tattoo that I want is really small. What is the shop minimum? Our shop mininum is $75. All of our artists charge by the hour. Depending on the artist, it ranges from $100 an hour to $130 an hour. Some of our artists charge more for cover ups so if you are looking to get a coverup it might be up to $150 an hour, again, depending on the artist. If you only take an hour and a half your tattoo will be prorated to the appropriate amount and you will not be charged for the entire hour. Am I allowed to have a friend with me for moral support? Yes, you are allowed to bring a friend for moral support. Although, our studio does not allow multiple people to come sit with the client while they are getting tattooed. The most we will allow is 2 people to sit back with the client and that is if we have the space and the chairs available. Your entourage is always welcomed to sit in our waiting area though! Are children allowed in the tattoo studio? No, you must be 18 to be in our tattoo studio. Although if you are just stopping by for a second or doing a quick consult we will not kick you and your children out. Please just keep in mind this is a very open tattoo studio so it is not recommended to have your children in here and if they are they must be in the waiting area. NO children are allowed during the actual tattoo. No exceptions. Do you have gift certificates available and do they expire? Yes, we do! You may purchase a gift certificate at any amount and there is no expiration date to your gift certificate. We also offer our gift certificates for purchase online with free shipping or you can pick it up at our studio. 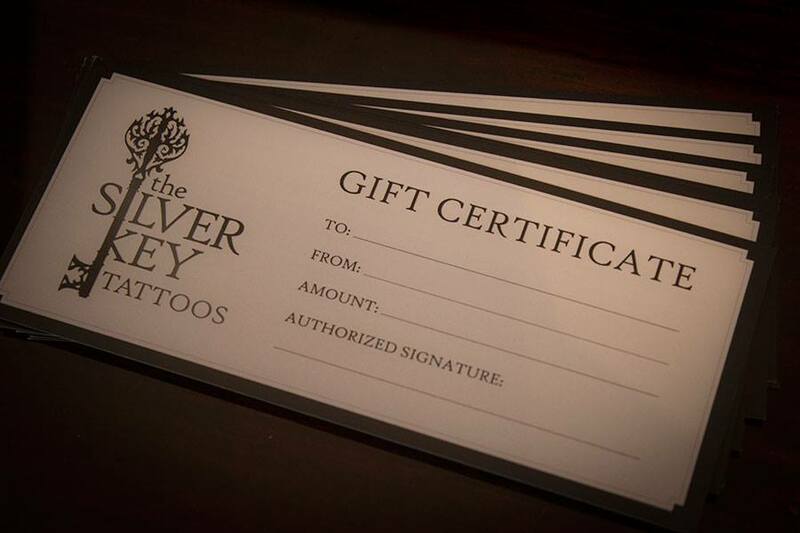 Please Note: Gift certificates cannot be used as deposits. Click here to order Gift Certificates online. Do you require a deposit for my tattoo? Yes, we do require a $50 deposit that goes to the overall cost of your tattoo. Depending on the artist, your deposit is completely refundable if given at least a 24-hour notice for cancellation or rescheduling your appointment. The Silver Key allows up to two reschedules with holding your deposit, on the third reschedule of your appointment your deposit will be kept. For your conveinence, some of our artists allow you to make your deposits online. If you plan to make your deposit online, please schedule your tattoo prior to making your deposit. For all other questions regarding deposits, please call us at (563) 322-0257. Do you offer free touch ups / guarantee your work? Yes, we do offer one free touch-up and must be done within one year of receiving the tattoo. Please note that when your tattoo is completed and if you feel something is missing or something you would like touched up during the tattoo apppointment, than you must say it at your appointment. Our artists want you to leave with the tattoo you envisioned leaving with. So please do not be shy and say what is on your mind before you leave. All artists will give you time to inspect your tattoo prior to completion. The one touch-up allowed is also up to the artist. If they believe the unsatisfactory healing of your tattoo was due to your negligance, the touch-up will be up to the artist's discretion. Yes, we have multiple tattoo artists that are experienced with cover up tattoos. Will you fix work that was done at another tattoo studio? Yes, if you feel as if your previous artist abilities or negligance was not to your expectations, than we would be happy to make your tattoo what you are hoping for. Please note: This also depends on the tattoo, sometimes there is not much that can be done due to the tattoo being too dark, large, ect. We will set you up with a consultation with an artist that we believe can achive what you are looking for. Do you have a piercer or offer piercing jewelry? No, we currently do not have a piercer or jewelry. Is there a way to get privacy for a tattoo that is in an area where I prefer to not be in the open? The Silver Key does provide privacy screens for those more "personal tattoos". Also, some of our artists are willing to take you in on a Sunday (we are typically closed on Sunday's) if you prefer complete privacy. Please let us know if you would like privacy screens or if you prefer to be scheduled when the tattoo studio is not open. Your comfort is our goal so please let us know if there is anything that we can do to make your tattoo experience the best possible! We currently are by appointment only. If you would like to see if we are accepting walk-ins please visit our homepage and you will see a banner saying that we are now accepting walk-ins. Also sometimes you can just walk in at the right moment and we might have a last minute cancellation. It never hurts to just stop by!